Saint-Gaudens National Historic Site in New Hampshire is the site of the studios of one of the country's finest sculptors, Augustus Saint-Gaudens. The site also includes gardens and his house. More than one hundred works of art created by Saint-Gaudens can be seen on the grounds of the site and in the galleries. These artworks include expressive portrait reliefs to heroic public monuments, as well as the gold coins that resulted in a change in the look of coinage in the United States. Visitors to the historic site can also discover new skills at a sculpture class, explore nature trails, or listen to summer concerts. More than one hundred acres of the Saint-Gaudens National Historic Sites is forested, with many nature trails winding their way through the woodland area. Interpretive panels along the trails provide information about the natural history of the area. The quarter-mile Ravine Trail starts at the Ravine Studio and ends at the Temple. A steep slope exists at the beginning of the trail and at the end, with most of the trail being flat and following along the Blow-Me-Up Brook. Near the western end of the trail is a swimming hole. The Blow-Me-Down Trail is two miles round-trip in length and starts past the temple at the lower field. Visitors can follow the trail to the lower end of the park, all the way down to the Blow-Me-Down Mill. There's a boardwalk close to the lower end of the trail that will lead guests to the mill pond's shallow end. Another quarter-mile trail at the historic site is the Sycamore Trail, a spur located off of the Blow-Me-Down Trail. This trail leads a spot often visited by beavers along the Blow-Me-Down Brook. The Saint-Gaudens National Historic Site hosts many programs and conducts several tours each week. The Special Art Tours, which lasts about forty-five minutes, takes place twice a day, but sometimes isn't available on Concert Sundays. This tour offers a chance to learn more about the art by Augustus Saint-Gaudens, as well as his life in Cornish. The Saint-Gaudens' Civil War Monuments Tour begins at 11:00am every day. 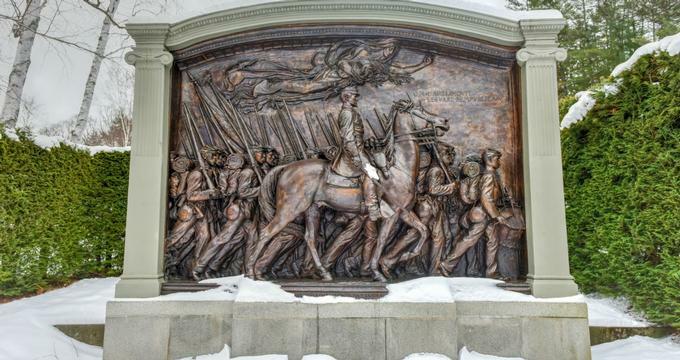 This tour commemorates the heroes of the country's internal conflict that dominated the public work by Saint-Gaudens. Tour participants will hear the tales that went into the making of these sculptures, as well as the impact of the artwork. Starting at 2:00pm each day is the Women and Saint-Gaudens Tour. Visitors have the opportunity to get to know the women of the Gilded Age who worked, loved, and lived alongside one of the best sculptor in the United States. These women both inspired the work of Saint-Gaudens, as well as created their own artwork. The Sculptural Process Tour also begins at 2:00pm. August Saint-Gaudens was an innovator in his time and a master of his craft. This tour explains the techniques he used and his process to create his sculpture masterpieces. There are also guided, special themed tour of "Aspet," the home of Saint-Gaudens. These tours happen almost every day, twice a day, and last about twenty minutes. These tours are limited to just twelve people, and tickets are offered every day on a first-come, first-served basis.